Albedo - a definition of this word describes a ratio of object's reflective power from the sunlight. Angular Diameter - The angle of diameter of a far away object, this measurement is defined in angles from the position of one object's outer edges to another's. The second name is "visual diameter". Annular Eclipse - during the eclipse of the Sun, the Moon is situated in amongst the Sun and Earth, so from the Earth the Moon seems smaller than the Sun, so the beams of sunlight befringe the Moon. Anomalistic Month - the time it takes for the Moon to reach its peak periods – 27.56 days. Through this period the Moon approaches both the closest and the most distant points to the Earth and repeats its cycle over and over again. Anorthositic Rock - type of the stone, vastly present on the lunar surface, has a lot of Calcium in composition. Aphelion - The most distant point from the Sun to an orbit of celestial bodies like planets or comets. Apogee - The most distant point on the Moon regarding to the Earth. Apogean Tide - Another title for low tide when the Moon is at the most distant point from our planet. Apolune - The most distant point of the object that surrounds the Moon. Basalt - A rock that is solidified from the freshly cooled lava, is considered to be a Volcanic stone. It can be found both on the Moon and the Earth. Breccia - A heavy mineral matter or rock that consist of various minerals, pieces of other stones, and additional materials. It can be found both on the Moon and the Earth. Celestial equator - a projected equator of our planet in the space. It is something like an unseen line that "welts" our planet in its middle. Celestial Mechanics - A technical sphere of Astrology that researches the gravitational differences of celestial bodies and their activity. Colongitude - the morning longitude of light and shadow border on the Moon's surface. Selenograpic colongitude is the second name for this term. Conjunction - from the point of the Earth, conjunction is a position when two or more bodies are situated as close to one another as it is possible. Crater Wall - steep wall, created by the collapse of meteor or other celestial body on the Moon's or another planet's surface. Crescent Moon - when Moon resembles the shape of the reaping-hook's blade that we see from the Earth, we call it Crescent Moon. It is the phase that goes after New Moon, and right before the New Moon. The second name for New Moon is Dark of the Moon. Dark of the Moon - it is the second name for a New Moon phase. Through this period the Moon cannot be seen in the sky. Declination - the position of the celestial body like planet or satellite regarding to the equatorial line. It is measured in degrees and can be higher or lower than the celestial equator's line. Diurnal - this term describes any object in the space that has instant 24hours repeatable activity like Earth's rotation that makes full rotation though 24 hours and then goes again. Diurnal arc implies the time an object needs to accomplish one full cycle. DST - it is an abbreviation for Daylight Savings Time, it is time when clocks are set on 1 hour ahead of usual time in order to save electricity. Earthshine - Earth reflects the incident sunlight. This sunlight then glares the other celestial bodies like the Moon. Eclipse - It is a blocking of light that comes from the sun. Solar eclipses are quite frequent, because the Moon on its path usually creates a barrier when is located between the Sun and the Earth. 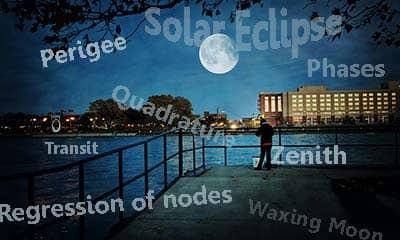 Ecliptic - This word refers to the great path the Sun goes through annually, from the perspective of Earth or other body. Elongation - it is a certain angle that creates Sun and any other celestial body from the Earth's point. Ephemeris - a text of chronological registration of celestial body positions through different times from Earth's perspective. This text provides coordinates of different space bodies for astrological observations. Equatorial Tide - it is an aftereffect of the Moon's gravitational pull that occurs every 328 hours in a form of tide, when the Moon is right above the equatorial line. Far Side - the "dark" or unseen from the Earth side of the Moon. First Quarter Moon - It is a phase when almost the half of the Moon can be seen from the Earth. It is the next phase after the Crescent Moon followed by Waxing Moon phase. 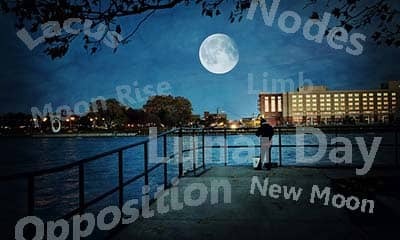 Full Moon - Through this period Moon is illuminated to its fullest extent. The Earth is situated between the Sun and the Moon, so the sunlight irradiates the Moon. 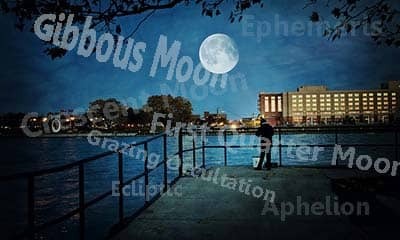 Gibbous Moon - it can be in two variations. The first one happens when the Moon is growing, between the Crescent and the Full Moon. The second one is when the Moon gets smaller in time from the Full Moon to the last quarter. So Gibbous Moon can be both Waning and Waxing. Gravity - It is a pulling force that manages the movement of the celestial bodies. Gravity is the main force in our solar system, as it manages the motion of orbits of all planets, and probably influences the Universe. It has a role of even mass partitioning in the Universe. Grazing Occultation - Moon's surface tends to make stellar objects (stars) disappear and then appear from the top or the bottom of the Moon's limit. It is connected with the movement of the Moon that enters different zones of the heavens that creates visual illusion of stars' disappearing. Greenwich Mean Time - Another name – Universal Time. Time from an average motion of the Sun during the year over the zero degrees longitude, passing through Greenwich, England. It is called mean due to approximate Sun's movement. It can be abbreviated as GMT or UT. Half Moon - It depicts and refers to the first and the last quarters of the Moon.